My cat JJ had a urinary track infection which required surgery to eliminate the problem. However after some time I found JJ was not using the litter box but doing his business right next to the box. I spent many hours trying to figure out how to retrain him to use the appropriate cat litter boxes. Because I have 7 cats I found out the following remedies to reintroduce JJ to using the littler box instead of the floor. Here is what I found out and want to share with all you cat lovers who might have the same problem. Like I indicated above it may be a medical problem, including diabetes, cystitis (inflammation of the bladder), bladder infections & bladder stones. You should have your cat examined by a veterinarian for any of these problems. A sexually male or female that has begun to spray should be neutered immediately. Spraying is urine marking in the standing position. Cats that have been spraying for only a short period of time are more likely to return to normal than cats that have been spraying for a long period of time. The sooner these animals are neutered, the less likely they are to continue spraying urine which marks their territory. One of the major thing to consider is the poor choice of litter. Some cats don’t like certain textures or oder and will become very picky about their litter. You need to notice when your cat stopped using the box when you have changed to a different kind of litter. If you have multiple cats you will need multiple boxes in different areas of the house. Dominate cats can intimidate your other cats in the house from using the litter box. Cats are creatures of habit. 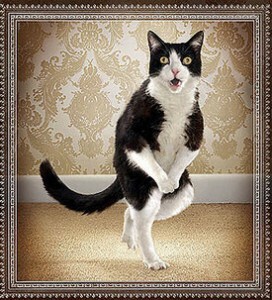 Often, if their routine is disturbed, they urinate in inappropriate locations. Changing the location of food, water, and bed can cause urine marking. Changing the location of familiar objects should be done gradually in order to avoid anxiety attacks. Each day, the box should be moved only a few inches. If the box is moved too quickly, the cat may urinate in the original location. You should clean the litter boxes at least once a day, but I prefer twice daily because of my multiple cats. I also prefer clumping litter and filling the box almost up to the top. Cats like to bury their waste, thus eliminating odors after using the box. So if your having problems, I recommend you investigate the above solutions so you and your cat can become happy friends. Also remember that homes with more than one cat should have one box for each cat, plus one more, to prevent littler box aversion issues from getting started. Litter box problems are much easier to prevent than to fix.